The AD7894 is a fast, 14-Bit Analog-to-digital Converter that operates from a single +5 V supply and is housed in a small 8-pin SOIC. The part contains a 5 s successive approximation A/D converter an on-chip track/hold Amplifier an on-chip Clock and a high speed serial Interface Output data from the AD7894 is provided via a high speed, serial Interface port. This two-wire serial Interface has a serial Clock input and a serial data output with the external serial Clock accessing the serial data from the part. 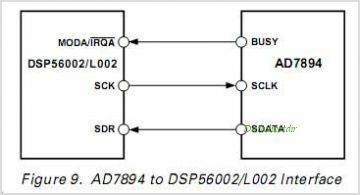 In addition to the traditional dc accuracy specifications such as linearity, full-scale and offset errors, the AD7894 is also specified for dynamic performance parameters including harmonic distortion and signal-to-noise ratio. The part accepts an Analog input range of 10 V (AD7894-10), 2.5V (AD7894-3), 0 V to 2.5 V (AD7894-2), and operates from a single +5 V supply consuming only 20 mW typical. The AD7894 features a high sampling rate mode and, for low power applications, a proprietary Automatic power down mode where the part automatically goes into power down once conversion is complete and "wakes up" before the next conversion cycle. The part is available in a small outline IC (SOIC). This is one package pinout of AD7894,If you need more pinouts please download AD7894's pdf datasheet. This is one application circuit of AD7894,If you need more circuits,please download AD7894's pdf datasheet.